Corn – Illinois’ top crop is used mainly for ethanol production, animal feed and agricultural exports. In 2011, the state produced 1.95 billion bushels of the crop, with a value of $12.3 billion. Corn accounted for 54.5 percent of total farm cash receipts in 2011. Soybeans – Soybeans are the No. 2 crop for the Prairie State, and its No. 1 agricultural export. Farmers produced 416 million bushels of soybeans in 2011, and the crop accounted for 30.4 percent of total agricultural exports. 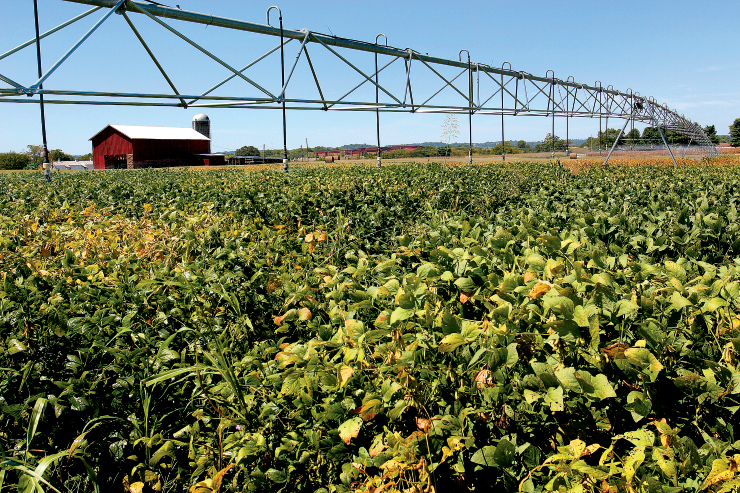 Illinois soybeans are used in everything from animal feed to printer ink. Pork – The No. 3 commodity for the state, Illinois pork production ranks fourth nationally. In 2011, the state’s swine farmers marketed 11.58 million hogs, and the commodity represented 7.2 percent of total farm cash receipts. Wheat – In 2011, Washington County produced the most of the state’s No. 4 commodity, bringing in a total of 4 million bushels. That state produces soft red winter wheat, which is used in products such as breads, cereals, crackers, all-purpose flour, pet foods and glues. Cattle – Hilly areas in the northwestern and southern regions of Illinois that aren’t as suitable for growing crops provide great pasture for cattle. Beef cattle, the state’s No. 5 commodity, can be found on 23 percent of Illinois’ farms. The beef industry brought over $523 million to the state economy in 2011. Dairy Products – Illinois is home to more than 780 dairy farms. On average, a dairy cow will produce six gallons of milk per day, totaling 2,190 gallons per year. That milk from Illinois’ dairies is processed into fluid milk, cheese, ice cream, butter and many other dairy-based products. Hay – In 2011, Illinois produced 1.58 million tons of all hay, including alfalfa. The value of production totaled $219.4 million, significantly contributing to the state’s economy. Most of the state’s hay is used as livestock feed. Fruits and Vegetables – Illinois’ fertile soil allows its farmers to produce a number of fruits and vegetables, with the top crops being apples, peaches, sweet corn, snap beans and pumpkins. In fact, Illinois is one of the leading states in the U.S. for pumpkin production, which brought $21.9 million to the state in 2011. Oats – Illinois farmers typically plant their oat crop in March and harvest in late summer or early fall. For many years, oats were used as a rotation crop, but farmers have started utilizing corn and soybeans more for this purpose. Sheep – Illinois had 57,000 head of sheep on hand at the end of 2011. That same year, the state produced 305,000 pounds of wool, with a total production value of $140,000. Consi9dering the potential for an alfalfa pellet mill across the river from Fulton Illinois. Would help alfalfa in NW part of the stae. PLease call me if inerested.